Monetary Policy is the process by which the monetary authority of a country controls the money. This study has been taken to conduct the different policies of monetary policy taken by Bangladesh. Only the secondary sources of data used to have the study. This paper provides a theoretical backbone of monetary policy. It also gives some names of instruments with their operational scenario. At the end, some problems or challenges have been found out against which some effective and also considerable recommendations have been given which may help in achieving the goal of monetary policy. 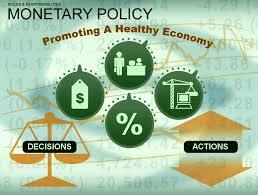 Monetary policy is the term used by economists to describe ways of managing the supply of money in an economy. It is the process by which the monetary authority of a country controls the supply of money often targeting a rate of interest for the purpose of promoting economic growth and stability. Within almost all modern nations, special institutions (such as the Federal Reserve System in the United States, the Bank of England, the European Central Bank, the People’s Bank of China, and the Bank of Japan) exist which have the task of executing the monetary policy and often independently of the executive. In general, these institutions are called central banks and often have other responsibilities such as supervising the smooth operation of the financial system. To give a theoretical overview of monetary policy in general. To know about Monetary Policy of Bangladesh. 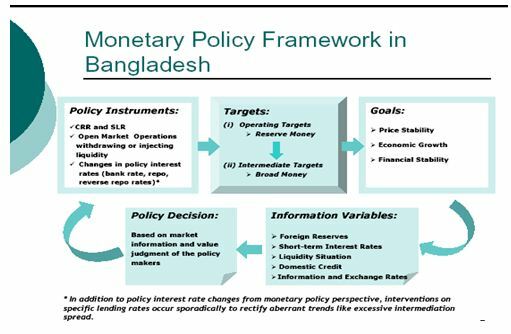 To explore the monetary policy tools those are used in Bangladesh. To investigate the challenges that create varies to the path of implementation of monetary policy in Bangladesh. This study has been prepared on the basis of experience gathered from theoretical knowledge. Only secondary data have been collected to prepare this study. I have presented my experience and findings by using different figures and tables in the various part of this study. The data are collected from the given sources. For preparing this study, I have collected the information from various website. Relevant information was not as available as required. Limited analytical tools have been used due to practical experience and time constraint. Due to lack of practical experience, some errors might be occurred during the study. Therefore maximum efforts have given to avoid mistake. Monetary policy is the term used by economists to describe ways of managing the supply of money in an economy. To Setup rate of interest. To promote economic growth & stability. To stabilize price & low unemployment. To control inflation & deflation. Monetary policy can be implemented by changing the size of the monetary base. Central banks use open market operations to change the monetary base. The central bank buys or sells reserve assets (usually financial instruments such as bonds) in exchange for money on deposit at the central bank. Those deposits are convertible to currency. Discount window lending is where the commercial banks, and other depository institutions, are able to borrow reserves from the Central Bank at a discount rate. This rate is usually set below short term market rates (T-bills).It is of note that the Discount Window is the only instrument which the Central Banks do not have total control over. The contraction of the monetary supply can be achieved indirectly by increasing the nominal interest rates. Monetary authorities in different nations have differing levels of control of economy-wide interest rates. . By raising the interest rate under its control, a monetary authority can contract the money supply, because higher interest rates encourage savings and discourage borrowing. Both of these effects reduce the size of the money supply. A currency board is a monetary arrangement that pegs the monetary base of one country to another, the anchor nation. As such, it essentially operates as a hard fixed exchange rate, whereby local currency in circulation is backed by foreign currency from the anchor nation at a fixed rate. Thus, to grow the local monetary base an equivalent amount of foreign currency must be held in reserves with the currency board. This limits the possibility for the local monetary authority to inflate or pursue other objectives. 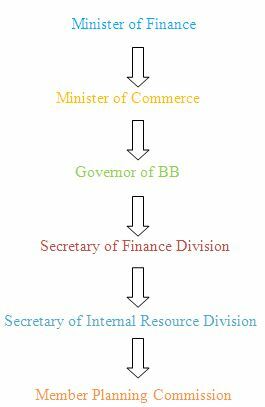 With the recommendation of World Bank/IMF, government in 2003 provided the degree of autonomy to the bank to carry out its responsibilities without undue interference of the government and a new body, called co-ordination Council. The MPC sets monetary policy that is consistent with domestic economic conditions to ensure price stability and sustainable economic growth. In addition, the MPC plays an important role in determining guidelines for exchange rate policy that is consistent with the monetary policy stance. Approximately every six weeks ( 8 times a year), the MPC needs to assess the economic and financial condition as well as the risk factors that may affect future inflation and economic growth in its consideration of monetary policy direction. In each meeting the MPC secretariat presents the latest economic data on financial market conditions, fiscal position, international financial environment, and production, as well as other factors that may affect the price level, including world commodity prices and US interest rates. The plausible trends of these variables are widely discussed and subsequently incorporated into the inflation and GDP forecasts. The policy adopted by the central bank for control of the supply of money as an instrument for achieving the objectives of general economic policy. As stated in the Bangladesh Bank order 1972, the principal objectives of the countries monetary policy are to regulate currency and reserves. To manage the monetary and credit system; to preserve the par value of domestic currency ; to promote and maintain a high level of production, employment and real income ; and to foster growth and development of the country’s productive resources in the best national interest. Although the long term focus of monetary policy in Bangladesh is on growth with stability, the short term objectives are determined after a careful and realistic appraisal of the current economic situation of the country. With the shift of the policy stance of the government in various phases, necessary adjustments were made in the country’s monetary policy in the first year after liberation, the primary target of monetary policy was to regulate not the quantity of money, but the direction of the flow of money and in support of the government financial programmed. In 1975, Bangladeh entered in to a standby-arrangement with IMF and the country’s monetary policy got a changed shape, which fixed an explicit target to save limit of monetary expansion on annual basis, with this change, Bangladesh Bank started setting short-term objectives of monetary policy in close collaboration of the government and tried to achieve the target by using the direct instrument of control. The principal target of monetary control was broad money (M2) i.e. , the sum of the currency in circulation and the total deposits of money in banks. The targeted growth of M2 depended on a realistic forecast of the growth rate of real GDP, an acceptable rate of inflation and an attainable level of international reserve. The MPS (Monetary Policy Statement) starts with expression of the monetary policy frameworks in terms of the goals, instruments, and the channels of transmission. Maintaining price stability while supporting the highest sustainable output growth is the stated objective of monetary policies pursued by the Bangladesh Bank. In this backdrop it is necessary that the monetary policy framework (in terms of the goals, the instruments, and the analytic channels of transmission) be articulated for greater clarity and transparency benefiting both the policy makers as well as the stakeholders. A policy system, where the goals are transparent and their achievement verifiable, directly adds to the credibility of the central bank, a major objective of this document is to define such a framework. Most industrial economy monetary policy is run with the task of keeping watch on both the output gap (i.e., the deviation of actual output from its long-run equilibrium level) and the inflation gap, which is similarly defined. In contrast, however, the challenge in the developing world is how to augment the capacity output through both productivity growths as well as via the installation of additional capacity. Faster growth in most developing contexts is necessary to reduce (and eventually eliminate) common poverty. Hence the appropriate monetary policy strategy in the Bangladesh context would be to achieve the goal of price stability with the highest sustainable output growth. Any monetary stimulus to promote growth must keep in perspective the broader goal of macroeconomic stability, which is a prerequisite for future growth. Price stability would also include the stability of the currency regime. The promotion of price stability. Supporting global economic and financial stability (so long as the latter maybe targeted without prejudicing the first two goals) as the chief monetary policy goals. In broad terms therefore the latter view is consistent with the BB vision as enunciated above, although anchored along different perspectives. that it is the core concept that better predicts the underlying price stability in the economy. Hence as a policy goal, core inflation may be a more credible target than CPI inflation. While there is no standard measure of core inflation in the Bangladesh context at this time, the construction methodology is made complex by two facts. First is that food items constitute nearly 60 percent of the CPI index, and while the appropriate commodity group weights may require a re-think, to ignore food entirely in defining the core inflation may render the construction a bit like throwing the baby away with the bath water. Secondly, in the Bangladesh context, the volatility of the international energy prices appear not to filter down to the CPI since the relevant domestic prices are subsidized by the state. Periodic adjustments in administered energy prices have always lagged the world market changes in both the time line as well as in magnitude often most dramatically. While it may be useful to focus on the non-food component of the index (which occupies only 41.6 percent of the full CPI) in order to gauge at the build-up of underlying inflationary forces in the economy, it would be unwise to treat this alone as a valid measure of core inflation. GDP growth projections of the Medium Term Macroeconomic Framework (MTMF) in the government’s National Strategy for Accelerated Poverty Reduction (NSAPR), modified appropriately in the light of unfolding actual developments, are used as output growth targets for the purpose of monetary policies. reserve money instead of credit ceiling. Major instruments of monetary control available with Bangladesh Bank are the bank rate, open market operations, rediscount policy, and statutory reserve requirement. The methods by which Central Bank controls the total amount of credit in the economy are termed as quantitative methods of credit control. The rate which central bank lends money to the commercial banks and discounts bill of exchange is called bank rate. If central bank increases the bank rate then the commercial banks will increase their marker of interest rates. As a result the borrowers borrow less form commercial banks and amount of credit reduces in the economy. In an opposite way amount of credit will be increased in the country. Effects on price level: If bank rate increases, cost of credit will increase and the businessmen will reduce their borrowing s form commercial banks. This will reduce production and increase unemployment in the economy. As a result, income and price level will go down and depression in business and trade will be the outcome. If there is a decrease in the bank rate the opposite e results of above will be experienced in the economy. increased bank rate will decrease the piece level because amount of credit will be reduced into country. This decreased price level will again encourage expert and discourage import, which will make balance of payment favorable. Opposite effects of above will be experienced if the central bank decreases the bank rate in the economy. i) Bank rate policy would not be effective if there lacks strong linkage between bank rate and market/ interest rate especially for a developing country like Bangladesh. ii) If commercial banks have excessive money; then bank rate may not be effective because they will lend in lower interest rates though bank rate increases. iii) Bank may successes during the time of prosperity. Because businessmen become highly ambitious of their profits in this situation and will borrow money though the interest rate increases. iv) Reduction in bank rate may not be successful to increase the amount of credit during the time of depression. So, bank rate policy has several limitations in its operation. After that it is the best weapon of central bank to control the amount of credit in the economy. The method by which the central bank controls the amount of credit by selling and buying government credit instrument is termed as open market operation. When the central bank intends to contract credit, it sales the credit instruments in the market. These instruments are purchased by commercial banks and people also buy them issuing cheque to the commercial banks. Thus money goes to the central bank and amount of money for credit creation reduces which in turn contracts the amount of credit in the economy. i) Selling- it reduces amount of cash of commercial banks .but if commercial banks take loan form central bank it would not be effective to reduce credit. ii) Buying- it increases the amount of cash in commercial banks. But it may not be able to expand credit if commercial banks repay loan to the central bank with this increased cash. iii) Depreciation- During depreciation credit expansion through purchasing credit instruments is not possible. Because in this period businessmen will not want tomorrow from commercial bank. thus credit creation will be contracted in the economy. In an opposite way central bank can increase the amount of credit by decreasing the reserve ratio. i) Increase in reserve ration can be effective for that commercial bank having small amount of cash. Because bank having large volume of cash will have sufficient excess reserve to create credit though reserve ration increases. In this case it will not be effective. ii) Decrease in reserve ration may not be effective to expand credit during depression businessmen are discouraged to borrow in this situation. iii) Non-scheduled commercial banks are out of this control. The methods used to control credit in special sectors for special purposes are called qualitative\selective methods of credit control. These methods do not deal with the amount of credit rather change the flow or direction of credit used in different sectors of economy. Rationing of credit means fixing the amount of credit among different sectors of the economy. By this method central bank can decrease the amount of credit in one sector and can increase it in other sector. For example, if central bank thinks that there is excessive investment in garments industry and jute industry suffers form required investment, then it can order the commercial banks not to disburse credit beyond required amount in garments industry and divert the excess amount to jute industry. i)Borrowers may use the credit money in other purposes. ii) It is difficult for central bank to supervise whether the credit money is being used purposively or not. iii) Sometimes commercial banks think this type of work as an unwanted intervention by central bank. If it is proved by central bank that credit creation policy of any commercial bank is not transparent then central bank can take punitive measures against that bank and thus affects its credit creation. These punitive measures may be of not rediscounting bills of exchange, discounting bills of exchange at a rate higher than the prevailing rare, etc. As a result, the commercial bank will compelled to follow sound central bank policy. It is a method to control credit in consumable goods, which are purchased in installment basis. If central bank circulates to increase the amount of down payment or reduce the number of installment then consumer’ credit will be contracted in the economy. In an opposite way consumers’ credit can be increased. It was followed in USA during Korean War. To make the banking system sound and efficient, central bank sometimes requests the commercial banks to increase or decrease credit. As a guardian’s request, commercial banks follow it and thus amount of credit is controlled in the economy. In Bangladesh there is a existence of non monetized economy in large extent people areas where many of the transaction are of the barter type and not monetary type .similarly ,due to non monetized sector the progress of commercial banks is not up to mark ,this creates a major bottleneck in the implementation of the monetary policy in Bangladesh. As the economy launch itself into a orbit of economic growth and development,the financial sector comes up with great speed as a result many non banking financial institutions (NBFI) come up ,these NBFIs also provide create in the economy ,however the NBFIs is do not come under the purview of a monetary policy and thus nullify the effect of a monetary policy. In rapidly growing economy the deposit base of money commercial bank is expanded, this creates excess liquidity in the system .under this circumstance even if the monetary policy increase the CRR or SLR, it does not deter commercial banks from credit creation ,so the existence of excess liquidity due to high deposit base is a hindrance in the way of successful monetary policy. Large percentage of money never comes in the mainstream economy, rich people, traders ,business and other people prefer to spend rather than to deposit money in the bank ,this shadow money is used for buying precious metals like gold silver ,ornaments ,and land and in speculation ,this type of lavish spending give rise to inflation trend in mainstream economy and the monetary policy fails to control it. The success of the monetary policy depends on timely implementation of it ,however ,in many cases unnecessary delay is found in implementation of the monetary policy ,or many times timely directives are not issued by the central bank , then the impact of the monetary policy is wiped out. In Bangladesh, capital markets should be expanded and organized enough to succeed the monetary policy. The credit control mechanisms like open market operation, bank rate, etc. should be effective. A narrow bill market should make the discount rate effective. Banking habits are also underdeveloped which hampers the effectiveness of monetary policy seriously. So banking habits should be developed. Steps should be taken to abolish the existence of liquidity trap. To run the monetary policy smoothly and effectively, it is essential to pay sufficient attentions to increase the GDP. In view of formulating credible monetary policy to attain the achievement of economic objective, the difficult part for the central banks is to distinguish, within ongoing inflation evolutions, between short term volatility and the underlying pressure of inflation,. While it has now become standard practice for most central banks around the world to monitor core inflation, no progress has so far been made in the Bangladesh context. The paper takes a pioneering look in measuring core inflation in Bangladesh focusing on the popular exclusion and trimmed mean approaches. The performance criteria adopted in this analysis so that the measure of core inflation developed in the paper has strong money-induce characteristics and therefore, can credibly be used as a short or medium term guide of monetary policy in Bangladesh.